How is it different than a traditional public school? Accountability: Charter schools are held accountable for how well they educate children in a safe and responsible environment, not for compliance with district and state regulations. They are judged on how well they meet the student achievement goals established by their charter, and how well they manage the fiscal and operational responsibilities entrusted to them. Charter schools must and do operate lawfully and responsibly, with the highest regard for equity and excellence. If they fail to deliver, they are closed. Choice: Parents, teachers, community groups, organizations, or individuals interested in creating a better educational opportunity for children can start charter schools. Local and state school boards, colleges and universities, and other community agencies interested in fostering innovation and excellence in schools sponsor them. Students choose to attend, and teachers choose to teach at charter schools. Why are Charter Schools popular? Charters provide the opportunity for better child-centered education. They provide the chance for communities to create the greatest range of educational choices for their children. Operators have the opportunity and the incentive to create schools that provide new and better services to students. And charters, bound only by the high standards they have set for themselves, inspire the rest of the system to work harder and be more responsive to the needs of the children. Charter schools are public schools. Most charters are created by groups of educators, parents and community leaders. Some have been converted from existing public schools. A small number of charter schools were once private schools. Like district public schools, they are funded according to enrollment (also called average daily attendance, or ADA), and receive funding from the district and the state according to the number of students attending. 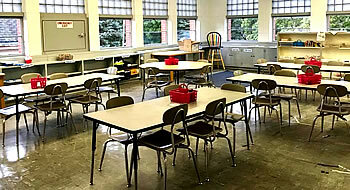 Unlike traditional district schools, most charter schools do not receive funding to cover the cost of securing a facility. Conversion schools begin with established capital, namely the school and its activities. A few states provide capital funding to start-up schools, and some start-up schools are able to take over available unused district space, but most must rely on other, independent means. Recent federal legislation provides funding to help charters with start-up costs, but the task remains imposing. Charter schools are havens for children who had bad educational experiences elsewhere. Among students performing “poorly” in their previous school (as judged by their parents), nearly half are now doing “excellent” or “above average” work. Charter schools are very popular with students, parents, and teachers. Families and teachers are seeking out charter schools primarily for educational reasons. Satisfaction levels are highest for all three groups when it comes to educational matters (curriculum, teaching, class size, etc.). Charter school teachers are diverse, but nearly all are finding personal fulfillment and professional reward. The teachers feel empowered. (Link to the full report: Charter Schools in Action Project Final Report, 1997) Charter schools serve their constituents well. Academic rigor is one of the primary reasons for the charter school movement. While it’s too early to measure charter schools’ broad academic success, anecdotal evidence suggests that students are learning and excelling. You are here: Home What's A Charter School?